Did someone call about empty pipes? I hate plumbing. I do. It just pisses me off. I don’t mind starting a project from scratch, but what I do mind is fixing someone else’s work. When you plumb for the first time, you can set everything up very nicely. Lay out your work, cut all your pieces to size, glue, thread, or solder everything together and boom: you’re done. When you’re adding a line to existing plumbing, you have limited options unless you want to drain all of your pipes. You’ve got compression fittings, adapters, reducers, couplers, and a thousand other little things that you have to crimp, thread, re-thread, glue, curse, re-buy, hit with a hammer, and finally encase in epoxy. 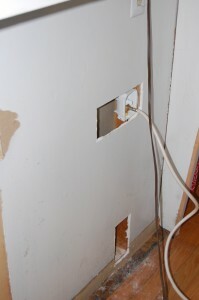 So, whenever the previous owners bought their newfangled ice-box with an ice maker, some $8-an-hour “contractor” drilled a hole directly through the floor, uncoiled about 25 feet of copper pipe, ran the piping through the floor and used a quick-tap to tap the line into the water mains, screwed that up and re-did the job with new epoxy adhesive, and just smashed about 10 feet of pipe behind the fridge. Not willing to drill a hole right in the middle of the new floor I will be laying, I put in a refridgerator water tap, and it looks a lot like the picture I posted above. Obviously, I have to fix the drywall holes, but Lord knows I’ve done that a time or two in this house. So, there it is. A freakin’ fridge tap that only took 4 hours to do correctly. I struggled with one stupid adapter I bought that absolutely would not stop leaking. I put some plumber’s dope on it, teflon tape, screwed it together so tight that I had to put it in a vice to get it loose, and nothing worked. So, like any good engineer would do after messing with a job too long, I resorted to a 3500 degree propane torch, a quick brushing of flux, and a dab of solder. Guess what fitting doesn’t leak anymore? 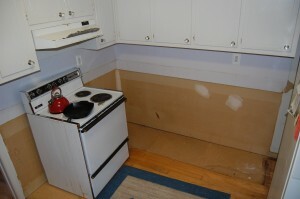 I am leaving the holes open now to verify that the leaks have all been addressed, but once it’s good, I’ll cover it up. To compare, the other job you see pictured only took an hour (and no, it wasn’t installing the stove). Previous Previous post: Can’t be more than 114!